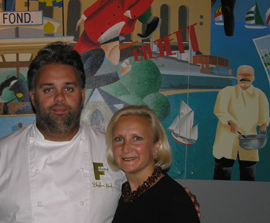 During a stay in Göteborg, Sweden in August 2005, we found that Chef Stefan Karlsson, owner of fond excels at creating innovative cuisine. Traveling around the world as we do, we always enjoy discovering what innovative chefs are creating. Fond, Chef Stefan Karlsson's one-star Michelin restaurant in Göteborg, Sweden, opened 6 years ago, was listed in the Michelin Guide its first year, and received its one-star rating the following year. Achievement is nothing new to this chef; he was named ‘Chef of the Year’ in 1996, at age 26. Located next to the Göteborgs konstmuseum the restaurant features a contemporary ambience with a curved wall of wraparound windows. The wood tables glow with candles, and dishtowels are used as napkins. Chef Stefan Karlsson is the consummate chef and host, and when we entered the restaurant, he was making the rounds, greeting his guests. His cooking style is traditional tastes and produce, but he likes to modernize it a bit. With that said, we were ready to sit back and put ourselves in his more then competent hands, as we went on a gastronomic journey at fond. We relaxed with a glass of Claude el la Chapelle 1:er Cru Brut Tradition champagne, which was dry with active bubbles, with an earthy nose, and green grapes, green apples and gooseberries on the palate. While we waited for our adventure to begin, we looked over fond’s impressive international wine list. Since this being Sweden, we began with Stefan Karlsson’s own brand of ‘Snaps’, Svenska Smaker, a citron-vodka made from potatoes with 35% alcohol, where his picture is emblazoned on the label, a chaser of a Danish beer, Carlsberg Hof, and 2002 Schaetzel Pinot Blanc from Alsace, to accompany our individual smorgasbord of amuse bouches: Cream of vegetable soup, Kalix whitebait roe with sour cream, toast and finely chopped onion, Back of cod marinated with avocado, marinated raw shrimp, “Steak tartar” with Swedish cheese, fresh beetroot and horseradish, Pickled herring, Wild caught salmon marinated with salt and dill seed, and matjes – herring from the island mixed with potatoes and capers, with a delightful sweet taste. I drank the ‘Snaps’, sipped the wine, and skipped the beer, while Edward enjoyed all three. Edwards’s tasting continued with Scallops Saint-Jacques with “cabbage pudding” served with a buttery stock, caraway seeds and mussels, where Stefan had exchanged the traditional minced pork in this dish with minced scallops. Paired with a Sancerre Cuvée Edmond Vielles Vignes 2000 from the Loire Valley, which had earthy notes and apricots, almonds and toast on the palate, this was a beautiful pairing. 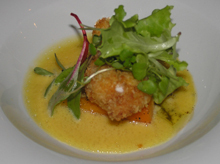 My tasting continued with Panko-style deep-fried crayfish with black pepper, presented in a deep white bowl with the crayfish propped up with glazed carrots, ringed with orange-flavored butter-cream sauce, and garnished with a mixture of baby greens. Paired with a creamy 2003 Jean Leon Terrasola Xarello, this dish was outstanding. We both loved the Wild salmon from Swedish waters, baked with white shallots and white vinegar, crayfish butter instead of Hollandaise, dill-glazed vegetables and a ragout of baby potatoes and fresh onions, paired with a 2002 Glen Carlou Reserve, a full-bodied chardonnay with a long finish from South Africa. The Butter-fried brill with asparagus, whipped dill and anchovy butter, pureed white turnips and lemon gravy was paired with a 2003 Porcupine Ridge Merlot from South Africa, with tobacco, leather and earthy notes on the nose, with ripe black cherries, plums, and black pepper on the palate. Grilled halibut with fresh Swedish octopus, tomato and raw-fried artichoke together with a dip flavored with fresh garlic, herbs and white wine gravy, was paired with a 2004 Lurton Bodega Pinot Gris from Argentina. An interesting wine note is that the brothers, Jacques and Francis, both in their 30’s, made wine in Bordeaux, before making wine in Argentina and Chile. Edward’s culinary journey continued with Veal ribs with deep-fried sweetbreads, slightly crisp fried chanterelles and veal stock mixed with Tiph’s thyme and butter, served with potatoes à la Grecque, and paired with a 2001 Santa Barbara County Pinot Noir. Our last pairing of the evening was a 1999 Tokaji Oremus Szmorodni Sweet from Hungary, paired with a Cloudberry sandwich and a parfait of almond sorbet, with sugary cloudberries. Afterwards, Chef Stefan joined us, where we discussed his approach to cooking and to life. He is someone who takes pride in keeping things local – using local produce, seafood and other ingredients. He changes the menu in the spring and autumn, and wanted to do something with Swedish flavors and ingredients, so it is different from other parts of the world. He was anticipating autumn; mushrooms, lobster season would begin on September 26, as well as using game, wild boar and lots of root vegetables. In Sweden there are 40-50 different types of potatoes. Boiled potatoes are traditional in Sweden. Previously, Swedish cooking was “white”, white potatoes, and white fish with a white sauce. Chef Stefan takes traditional ideas and tweaks them to modernize. He likes to add cinnamon and cocoa to game, uses Svensk vodka in vanilla ice cream, and created his citron ‘Snaps’ because lemon is used on fish, herring, and shellfish, so why not serve it as a drink instead. He is a frequent globetrotter, traveling with Volvo to bring Swedish cuisine around the world. When not traveling, he likes to spend time with his family, his wife, son and daughter. He said that his daughter always wants to sit with her dad at the stove, and make “real” food, so maybe there is a future chef in the family. He loves nature, and loves to pick wild mushrooms, likes fly-fishing, as well as trout and salmon fishing, but when it comes to skiing, he lets his wife ski, while he prepares food instead. So, where does a chef go on vacation? He said that he likes to go to interesting food places. One of the more interesting things he has tried was a fruit bat pate, which he admitted that he didn’t like. So, how did he get where he is? Hard work, a great attitude, inspired creativity and solid work experience – he worked at 28+, another one-star Michelin restaurant in Göteborg for five years. 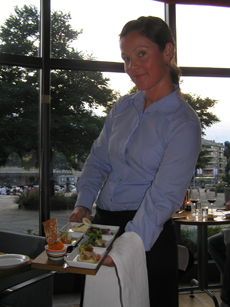 We can’t wait to return to fond to sample the rest of his menu! Read about fond and Göteborg in our Hotels, Restaurants and Chefs’ Recipes sections. For more information on Göteborg and Sweden, please visit: www.goteborg.com, www.visit-sweden.com, http://www.west-sweden.com/ and www.vastsvenskmersmak. © December 2005. Luxury Experience. www.LuxuryExperience.com. All rights reserved.